Park Square and Park Crescent were built on land that belonged to the Crown and were designed as part of John Nash's original conception for The Regent's Park of 1811. His plan for developing the former royal hunting chase included the 400-acre park, to be surrounded by villas and terraces. There were to be two circuses, one in the park and a south circus with the parish church in the centre where the Crescent is now. Only the southern semi-circle was realised due to financial problems. By 1823 the north half of the circus had been cancelled and replaced by a square, with its north side open to the park. 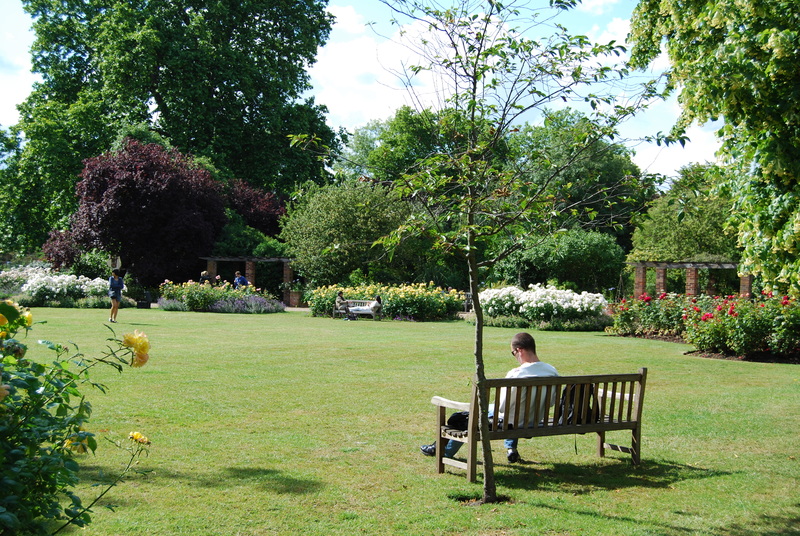 Park Square was built in 1823-25 comprising two parallel terraces facing east and west across the private garden for the use of residents, which was connected to the Park Crescent garden by The Nursemaids' Tunnel under Marylebone Road. Both gardens are well laid out with lawns, numerous fine trees, flower and shrub beds. Children's playground, toilet, 3 grass tennis courts. Park Square and Park Crescent (q.v. ), like Regent’s Park, were built on land that belonged to the Crown. Originally part of the vast forest of Middlesex, by the C16th the area was owned by the Abbess of Barking and called Marylebone Park after a village and manor nearby. In 1538 the land was appropriated by Henry VIII and enclosed as a deer park. During the Civil War (1649-60) it was taken by Cromwell and many of its trees were cut down during the Commonwealth to pay war debts. After the Restoration it was returned to Crown. By the early C18th the land was leased to the Duke of Portland and farmed by tenant farmers but reverted to the Crown in 1811. The Prince Regent proposed building a summer palace here and developing the area around it into a park with upmarket housing that would help pay for the development. The palace was one of several suggestions for the development of the area that was abandoned. John Fordyce, Surveyor General of H M Land Revenue from 1793 until his death in 1809 commissioned both John White and John Nash to submit plans for the Crown estate land. Nash’s plan, which included the area now occupied by Park Square and Park Crescent, was accepted by the Crown in 1812 although it was subsequently substantially altered. There were to be two circuses, a large circus in the park and a south circus with the parish church in the centre where Park Crescent is now. This was originally planned by Nash as a full circus to provide a grand entrance to the Crown Estate, but only the graceful and elegant southern semi-circle was realised. If Park Crescent had been completed, it would have been the largest circle of buildings in Europe. The New Road was to be realigned to accommodate the plan, since renamed Marylebone Road and which separates Park Crescent from Park Square and the rest of the park. Nash’s design for Regent's Park may have been influenced by plans published by Humphry Repton in 1794 for the development of the Eyre Estate in St John’s Wood, which also included a double circus. Park Crescent was built in 1812-22 but the project hit financial problems and Charles Mayor, builder of the south circus went bankrupt with only 6 houses built in the south-east quadrant. Although building recommenced in 1818, by 1823 the north half of the circus had been cancelled. What would have been the northern half of Nash’s intended circus was replaced by a square built in 1823-5 to the north of New (Marylebone) Road. With its north side open to the park, the houses consisted of two parallel terraces east and west of a central private garden for the use of residents. The Park Square garden was connected to that of Park Crescent by a pedestrian tunnel under Marylebone Road, known as The Nursemaids' Tunnel. During the 1920s the original 99 year leases on the houses began to fall in and Crown policy was to renew them for a further 21 years but at a higher rental. However, in the late 1920s and 1930s economic conditions were difficult and many properties were left vacant. During WWII, the western sector of Park Crescent was destroyed by bombs and many of the terraces around Regent's Park, including some around Park Square, were damaged and then allowed to deteriorate. After the war extensive demolition was seriously contemplated and a Commission chaired by Lord Gorrell was set up by the Labour Government in 1945 to consider what should be done about the decaying terraces. The 1947 Gorrell Report recommended the terraces be reconditioned or converted behind the original façades. As a result, the newly organised Crown Estate Commission undertook to preserve, and where necessary rebuild Park Crescent, Park Square and York Gate, despite the cost. The restoration began in the 1960s and between 1960-63, the terraces of Park Crescent were demolished section by section and rebuilt behind a façade identical to that designed by Nash. Rebuilding the terraces of Regent's Park took longer. Much of the rubble from the demolished terraces was dumped into the gardens of Park Square and Park Crescent. Park Square is one of the largest of London's private gardens, and is dominated by the Waterloo Planes that were planted in 1817 to commemorate the Battle of Waterloo. Other trees include weeping willows, a Robinia pseudoacacia, and ash, including one in Park Square believed to be over 150 years old; both gardens have pendulous limes. There are two commemorative trees in Park Square, a Prunus ‘Taihaku’ (great white cherry) planted 1 January 1963 in memory of Sir Vincent Wilberforce Baddeley and an Amelanchier planted in 2004 in memory of Richard Hammersley. In recent years new railings and gates have been installed to the original designs. Park Square and Park Crescent lost land when Marylebone Road was widened in 1968 when two of Park Square's four lodges, those on the south corners, were demolished. Between 1961-68 larger lodges were built on the north-east and north-west corners. The lodge on the south-east corner was replaced by a single room building, now a toilet for garden users. That on the south-west corner was replaced in 1966 by a larger building, which was used as the Crown Estate Paving Commission office until c2004 when it moved offices to the lodge on the north-east corner, which at that time was the residence of the Head Gardener. The lodge on the north-west corner is the residence of the Inspector of Pavements. Park Square is enclosed by c.5ft 6ins black cast iron railings that were put in place in 2002 and are reproductions of the originals. However Park Crescent has its original railings designed and cast by the ironsmith John Peachey who was responsible for almost all the iron work in the Park. Peachey was also an investor in the park and owned the lease to one property in York Terrace and two in Cumberland Terrace. Mid-way along the east side of Park Square is a wood and wrought iron summer-house with wrought iron lattice work inside. It was possibly built as a tennis pavilion, of which there may have been two originally, the other situated near where the sheds are now. Near the south-west of Park Square is an octagonal building built in 1972, which houses a ventilation shaft for the Jubilee Line; it has a circular roof with metallic trellising and decorative alcoves with benches in them. The new line was at first called the Fleet after the River Fleet, although it would have only crossed this at Ludgate Circus, but was renamed the Jubilee Line for Queen Elizabeth II's 1977 Silver Jubilee. The original choice of battleship grey for the line's colour was based on the naval meaning of the word fleet; this was replaced by a lighter grey, representing the silver colour of the Jubilee. Two similar ornamental ventilation shafts for the Bakerloo line are found in Park Crescent, that towards the north-west side was moved from the middle of Marylebone Road and situated here when the road was widened in 1968. Park Square has a matching pair of pergolas toward the centre of the garden dating from the 1950s, planted with rose, ivy and other climbers. A Garden Committee was formed at the suggestion of the Superintendent Gardener to discuss issues relating to the running and maintenance of the gardens, and makes recommendations to the Crown Estate Paving Commission. The EH Register of Parks and Gardens entry for Regent's Park was amended in November 2008 to include Park Crescent and Park Square. OGSW leaflet; Bridget Cherry & Nikolaus Pevsner, 'The Buildings of England, London 3: North West (Yale University Press, New Haven & London, 2002); J Mordaunt Crook, '	London’s Arcadia: John Nash and the Planning of Regent’s Park', Annual Soane Lecture, 2000; Peter Cunningham, '	Handbook of London' (1850); Terence Davis, 'John Nash: The Prince Regent’s Architect' (Country Life, London, 1966); James Elmes, '	Metropolitan Improvements; or London in the Nineteenth Century: being	a series of views of the New and Most interesting objects in the British Metropolis and its vicinity, from original drawings by Thos H Shepherd' (Jones & Co., London, 1829); George Gater and Walter H Godfrey (eds), 'Survey of London, part 19', (LCC, 1938); Ann Saunders, 'Regent’s Park: From 1066 to the Present' (Bedford College, London, 1981); John Summerson, 'John	Nash: Architect to King George IV', (George Allen & Unwin, London, 1935) and 'The Life and Work of John Nash: Architect' (George Allen & Unwin, London, 1980); Christian Wolmar, '	The Subterranean Railway '(Atlantic Books, 2004.